Home > Advice > How to wear the skirt pleated sun this summer? How to wear the skirt pleated sun this summer? 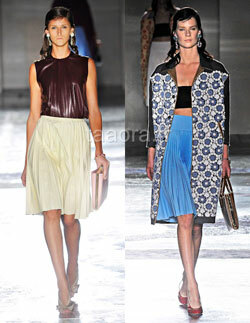 The pleated sun made its comeback to the skirt fashion Spring / Summer 2012. Houses such as Prada, Chloe, Roberto Cavalli Celine or have honored him in their own way: 50s style Prada, Chloe vaporous, or downright strict with Celine Sequin in Roberto Cavalli. How to wear sun pleated skirt? Some tips to capture that trend in this article! What is the pleated sun? Reminder: the pleated sun is reflected on the clothes of circular shape, like the skirt, and is characterized by very narrow pleats at the top and then widened at the bottom of the garment recalling the sun, hence its name. Prada fashion show Spring / Summer 2012. Parades and Celine Chloe Spring / Summer 2012. This summer, how to wear sun pleated skirt? What skirt length? As you prefer pleated skirt because the sun will decline both long version, that version of noon or short. What matter? In sailing, leather or shiny material. With what top to wear? This skirt in retro style is marked to be associated with a high simple as a basic t-shirt a little loose, a fluid top with spaghetti straps, a chic white or pastel gown, a white shirt. Alternatives more original: a leather top if your skirt is sailing, a t-shirt jersey for a note sportswear (as seen at New Look) or a headband with a high waist skirt noon (see Prada look). With what shoes? With stylish heeled sandals, wedges, high heels or sandals (for version rather long skirt). Where can I find a skirt pleated sun? You will find many models at Topshop and 3 Suisses , but also in New Look and Miss Selfridge . 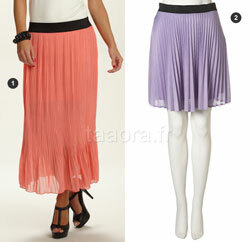 A. long skirt pleated coral (Actuamode, at 3 Suisses, 8 € – Also available in beige, orange and green). 2. purple pleated short skirt (Topshop , € 44).